I originally got these as part of the free new product shipment Blue Bunny sent me at the beginning of the year. Yeah, these cones just kept getting pushed back further and further on my review list. Now don't get me wrong, they're not bad by any means. 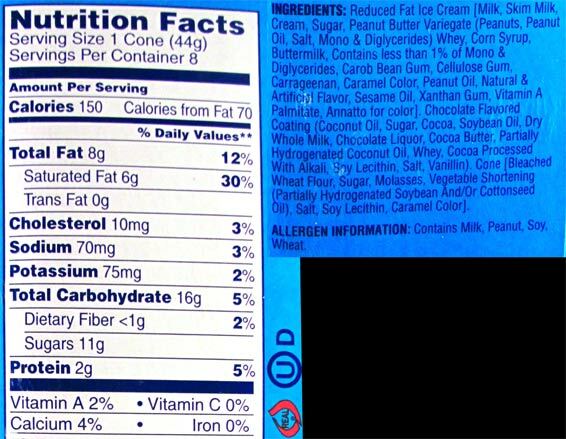 They have a strong, natural peanut butter flavor from the ice cream. You really can't even tell it's low fat either. The shell is fine in flavor though a bit on the fragile side. 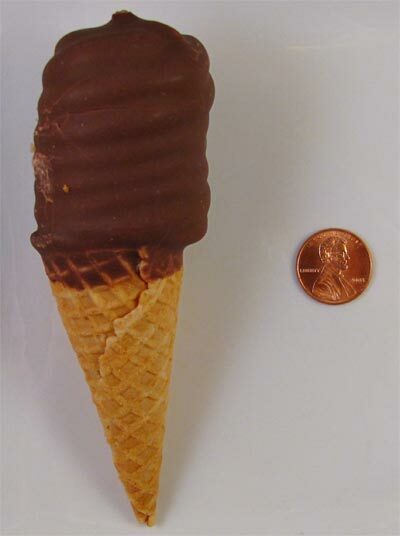 ‎Heck, even the cone itself has been crunchy every time without any bit of sogginess. The main problem lies in the part I was excited for the most, the peanut butter center. Now it's no surprise that peanut butter can get hard in ice cream but there's normally some pliability to it. That is not the case here. This stuff is rock hard and there's no effective way to remedy the situation. If you let it sit out for a bit, nothing changes. If you let it sit out longer, you end up with a very soft shell, melted ice cream and a peanut butter core that's still quite hard. I think the problem is the density of the peanut butter. If it was spread out in tiny shards or even a tiny swirl throughout the ice cream, things would've been way better. As is, you're a bite or two away from having to see your dentist. On Second Scoop: Seeing as how firm the peanut butter is, I decided to see if I could remove the center by itself and it actually worked. 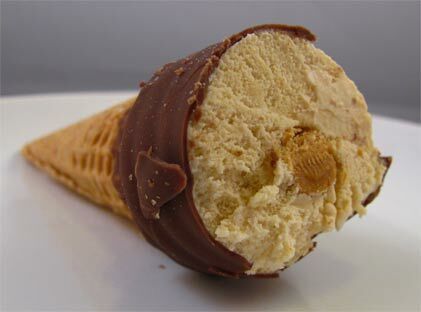 Now I was able to enjoy the cone without having to worry about biting into the rock hard peanut butter. I didn't recall how long I let the peanut butter sit out but at least 30 minutes later, it was almost chewy in texture. When I first saw these on shelves several months ago I was tempted to buy it impulsively, since peanut butter ice cream is not just my favorite flavor of ice cream but my favorite food. But I never did buy them, deciding to wait to read from reviews if they would actually live up to the hype I had imagined. My biggest issue with ice cream cone novelties is that they are a tease because not enough ice cream is given per cone. Now that I know these were disappointing, I won't be buying them; so, thanks for the review. I have two year old twins who normally love mini cones. 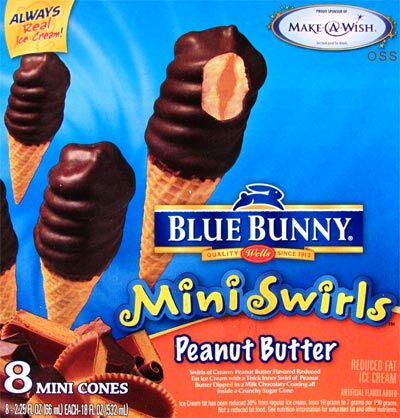 I tried these because they raved on them on the NBC Today show describing them as Reeses PB cups in ice cream form. Well I ran into the same problem with the core. My kids hit it, and that was it. They couldn't get through it. It was a disaster. I had to cut their cone up into small pieces with a knife just so they could eat it. Taste was not bad, but this was executed poorly. Stride, it's what I'm here for. They seem to be discontinued, sorry!